In 5th Grade with Teacher Julia: Courage for Beginners - A Middle School (or soon-to-be) Must Read! Courage for Beginners - A Middle School (or soon-to-be) Must Read! As I start to plan for next school year, I am thinking about my very first unit which reflects Responsive Classroom in a lot of different ways. I spend the majority of the first 6 weeks of school focusing on building community, assessing my students' abilities and bringing the class together with common goals and rules that we all agree on. I mostly do this through Reading and hands-on activities. In the past, I used the book, Wonder by RJ Palacio as a read aloud and stayed away from whole group Literature Circles. However, after my third year here, I am starting to see that my new 5th grade students could definitely handle a whole class Literature Circle and I am thinking about implementing one next school year in September. Now.. the question I need to answer is, which book do I use? Well... I think I have answered that question. 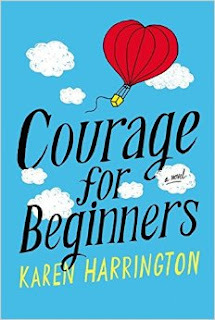 Courage for Beginners by Karen Harrington is one that, after some consideration, I've decided to use. This book is one of my favorites for a number of reasons. It is told from the point of view of Mysti, a student who is starting her seventh grade year. She has a very interesting personality and a unique sense of humor. I think her voice throughout this story is what makes it so fabulous and fun to read! She and her friend Anibal were best friends for years. The one thing that bonds them the most is the fact that they both are somewhat ashamed of something that takes place at home (it is implied in the story that Anibal's family is poor and we learn early on that Mysti's mom has a condition which makes her afraid to leave the house). Both Anibal and Mysti are not a part of the "in crowd" which also creates a strong bond between the two. Right before school starts for these seventh graders, Anibal declares that he is going to do an experiment and would like Mysti's help. All she has to do, he says, is to not talk to him at school. Mysti goes along with it and after denying what seems obvious to everyone else, she starts to question her friendship with Anibal. There are other characters brought into the story to remind readers of what a true friend looks like and the fact that how we treat each other reflects the kind of person we are. In the meantime, because of a head injury at the beginning of the story, Mysti's father is left in a coma at the hospital. Because Mysti's mom refuses to leave the house, Mysti is forced to play the role of her father and left trying to solve problems such as, what to eat when there is no food and no adult in the house who can go to the grocery store. This book is one where students have laughed out loud, but also gotten very upset with some of the characters and his/her decisions. I've witnessed kids talk about these characters are real people and often bring them up again in conversation long after the book has ended. It is definitely a story that sticks with you even after the last chapter. To help guide the lessons and discussions, I created an Interactive Notebook. This is for students to complete independently after the Literature Circle discussion so that I can check their understanding and to encourage them to think deeply about the story. Because it is hands-on and engaging, students will not feel like it is a typical assessment even though it does allow me to evaluate their level of understanding. 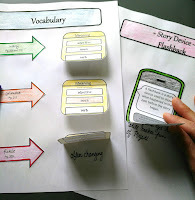 I included discussion questions with each section that will help guide the Literature Circle which also creates a checklist that I can use to track students throughout the discussion. At the end of the story, I have students complete a Character Map specifically for Mysti as a fun way to reflect on who she is as a person/character! I haven't read that one. The One and Only Ivan is a great book about friendships, too. I would love to collaborate on your $3 board and any others you may have. I have a lot of $3 products. I also have multiple pinterest boards that you may join. The One and Only Ivan - I heard such great things about it and have it in my classroom library. The kids say they love it. I will add you to the $3 board. There are some really great products on there! Thanks!